His Majesty King Hamad bin Isa Al Khalifa arrived here today on an official state visit to brotherly Turkmenistan, at the invitation of President Gurbanguly Berdimuhamedow. The two leaders will hold talks on ways to enhance the distinguished bilateral relations and open up new horizons of joint cooperation in various fields. They will also discuss the latest regional and global developments, and issues of mutual interest. Upon arrival at Ashgabat International Airport, HM the King was welcomed by Turkmenistan’s Deputy Premier and Foreign Affairs Minister, Rashid Meredov, and Bahrain’s Ambassador to Turkmenistan Dr. Yousif Al-Abdulla. 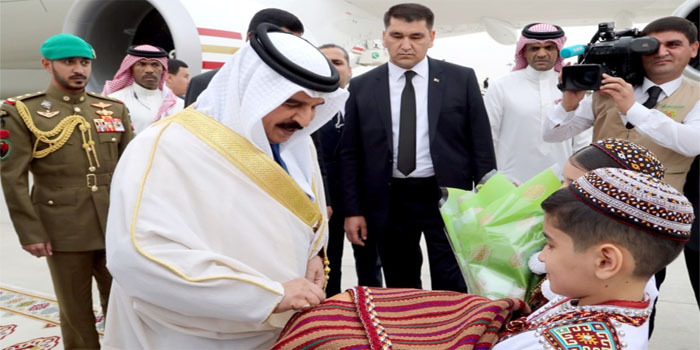 A boy and a girl presented HM King Hamad with bread, salt and a bouquet of flowers to welcome his visit, in accordance with the Turkmen traditions. The guard of honour lined up to salute HM the King, who then left to his residence here within an official convoy. In a statement, HM King Hamad expressed deep pleasure at visiting brotherly Turkmenistan, and expressed sincere thanks to Turkmenistan president for his invitation, as well as on the gracious welcome accorded to HM the King. “This affirms the strong brotherly relations between our countries and peoples, and reflects the extent of our desire and strong will to continue developing our relations so that they reach wider horizons and strengthen our strategic partnership in various fields, in a way that would serve our common interests,” HM the King said. “Our visit to this brotherly country, which is witnessing a great renaissance at all levels, embodies the depth of the relations between our brotherly countries and peoples. It is also an opportunity to meet our brother, President Gurbanguly Berdimuhamedow, to discuss our bilateral relations, and ways to bolster them. We will also discuss regional and global issues of mutual concern in a way that would serve our common interests, achieve the aspirations of our brotherly peoples and back efforts and endeavours aimed at strengthening security and peace at the regional and international levels,” HM King Hamad added. HM King Hamad left the kingdom earlier today, heading to brotherly Turkmenistan.